When the Yarn Speaks to You. Sometimes you can’t resist buying a particular yarn because it speaks to you in someway. Like this one I found at The Yarn Lady on my yarn crawl back from LA last December. Schaffer names the type of yarn is a first name, like Andrea, Audrey,Anne, etc. Their colorways are named after influential women. 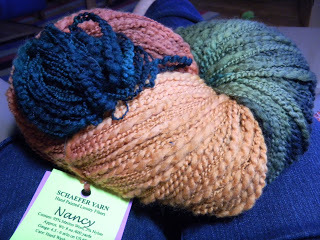 Not only is name of this yarn Nancy but the colorway is Elizabeth Zimmerman. How could I deny myself? It would have spun the Earth off its axis had I passed this up. I think it wants to be a very simple shawl. Sometimes the pattern speaks to you. I found this pattern on Ravelry and knew immediately that my BMFA Seduction in Pond Scum had met its destiny. Seduction is 50% Merino and 50% Tencel. It has a great hand. The tencel doesn’t take the dye as much as the merino and it gives it a great sheen. Pond Scum is a Shaded Solid and is my all time favorite Blue Moon colorway. School is almost out, that means more time for knitting! Have a happy summer! 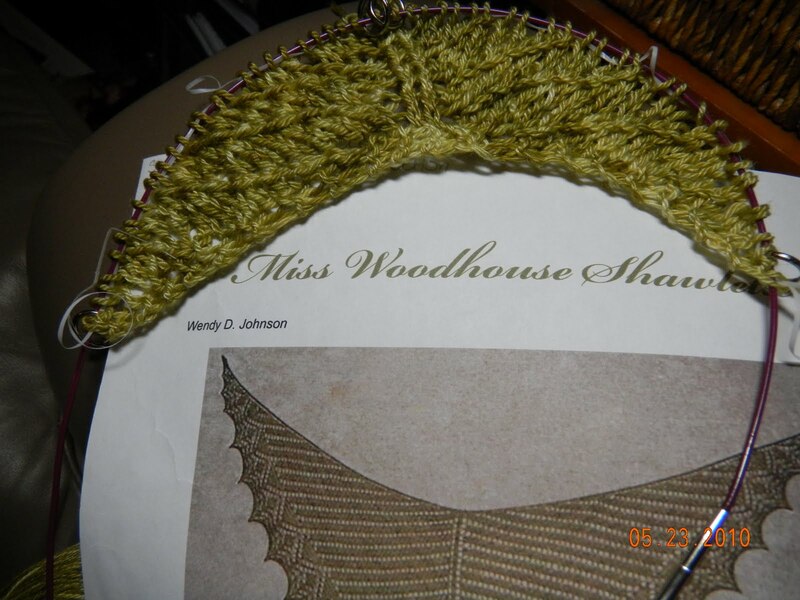 Love your shawl pattern and yarn combo!